Well, my friend Matt (splitboarder) and I decided to head for the Russell Glacier to get our August turns in as early as possible. We followed the bare trail all the way to Spray Park and then south along the ridge to 7000 ft. We skinned up the eastern lobe of the Flett to 7600 ft, then carried skis across to the Russell, and skinned up to a prominent knob at 9200 ft along Ptarmigan Ridge. This is currently the highest skiable point on the Russell, as everything above here is very rough and bombed out (as in completely carpet-bombed, densely covered with craters and holes of all sizes, many with rocks at their centers). The transition from smooth snow to cratered is very sharp and sudden. 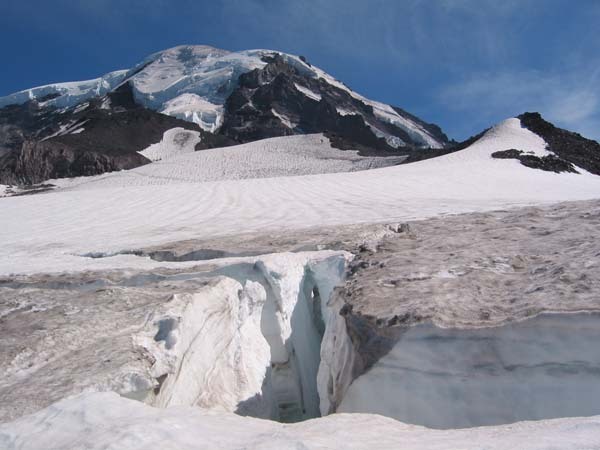 Crevasses are opening along the route in several obvious spots, but these are easily avoided. We skied down around 4:30 pm on nicely softened snow, only moderately runneled and lightly suncupped. After crossing back on to the Flett Glacier, we crossed the talus ridge below Observation Rock and skied the central lobe of the Flett. The best skiing of the day was on the pitch above the prominent moraine lake, nice corn snow here (this section is no longer connected with the steeper face above). We skied past the lake and down to about 6200 ft in Spray Park, a couple of short carries were need to cross bare patches below the lake. Bugs were not too bad at all in Spray Park or anywhere else along the trail. Totals for the day: about 5000 ft of gain (counting ups and downs on the trail) for almost 3000 vertical ft of fairly good skiing. This photo shows the upper part of the Russell glacier, as we skinned up past a large crevasse. We skied from the high knob at right, heading down towards the right edge of the picture. The heavily cratered snow is visible at center. Click here for a double-size version of this photo.